The weather is still fine, but not for much longer, if the forecasters are correct. After a visit to the harbour area of Bridlington, and passing the shops stuffed full of superb fresh fish and a vast collection of local shellfish, we decided on some big prawns. After trawling through food sites on the internet, we found this Garlic Prawn Pasta Recipe from Donna Hay and as we had just bought a plait of fresh garlic bulbs, tonight’s meal is sorted. 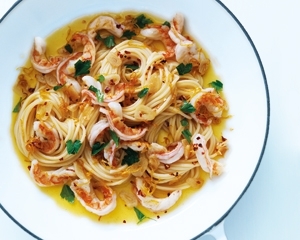 This Garlic Prawn Pasta dish is a light meal and fast to cook. It is a recipe from Donna Hay found on the Good Food Channel website. I fancy adding finely chopped shallots to the garlic mix in the frying pan, and finishing off with some pancetta strips grilled to crisp and sprinkled on the top. Ummm - can't wait to taste this. Cook the pasta in a large saucepan of boiling salted water for 8 - 10 minutes or until al dente. Drain well and keep warm. Whilst the pasta is cooking, heat a frying pan over medium high heat. Add the butter and oil and cook until the butter has melted. Add the garlic, chilli and lemon zest and cook for 2 minutes. Add the prawns and cook, stirring gently, for 3 minutes until the prawns are tender and pink. Add the pasta, juice, parsley and sea salt and black pepper to the pan. Toss to mix well.